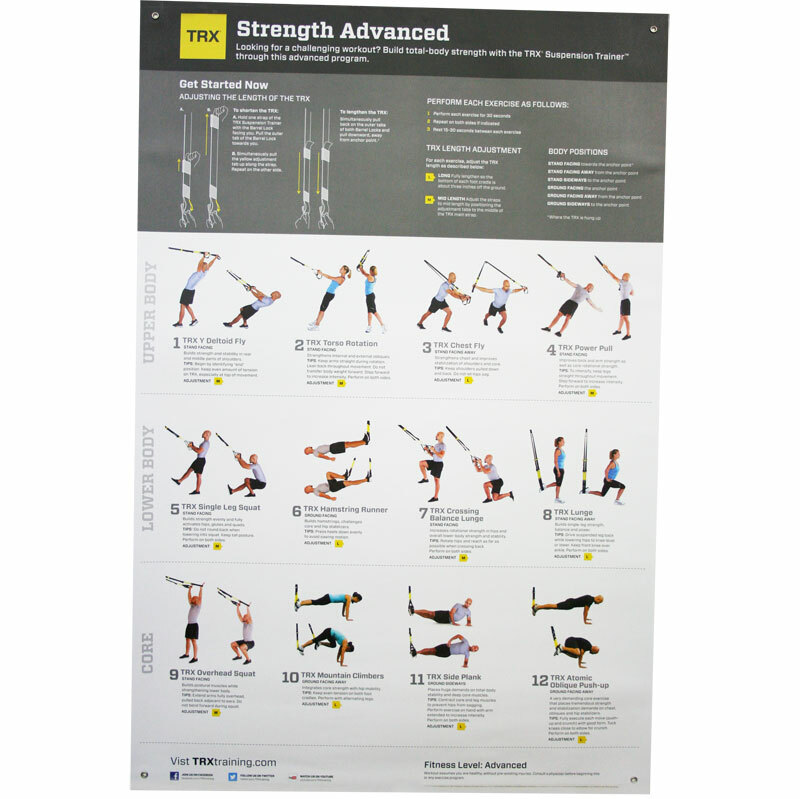 TRX ® Body Strength Posters V2 puts the expert help you need right where you work out. Invest in a Authorized TRX® please click here to find out more about what TRX ® are doing to tackle counterfeits. Keep this concise 2' x 3' visual exercise guide close by when developing a total body, strength-building regimen. Poster includes instructions for making the exercises more challenging. Simply hang it wherever you train. Tear-proof and spill resistant. The TRX ® All Body Strength poster puts the expert help you need right where you workout. Features 12 clearly illustrated exercises for building upper body, lower body and core strength.Also guides you in progressing the exercises to make them more challenging and shows you how to quickly adjust your TRX ® Suspension Trainer for different exercises. 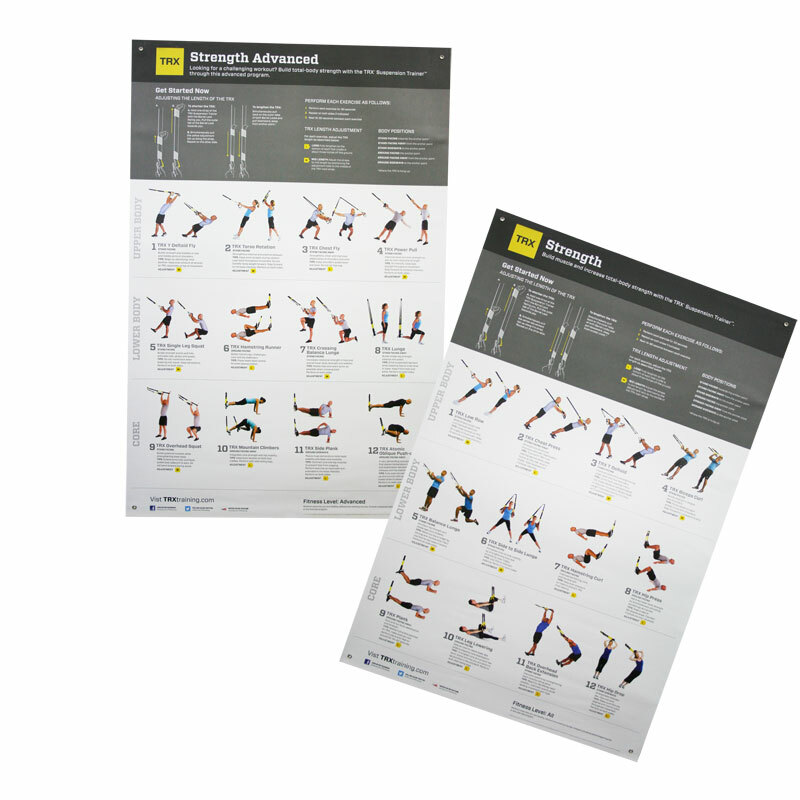 TRX ® All Body Strength poster is your convenient guide to a total strength workout. Comes in a spill resistant, tear-proof, 2' x 3' format that fits just about anywhere. A great accessory. Take your total-body strength to a new level - with or without your trainer. Get all the visual aid and instruction you need on one convenient poster. Take your training up a notch-even when your trainer's not around-with the new, portable, TRX ® All-body Strength - Advanced poster. The tear-proof, spill-resistant 2'-by-3' poster illustrates 12 exercises for developing upper body, lower body and core strength. It features a series of clear double images for each exercise, plus handy tips for how to take them up or down a few notches to suit your own personal fitness level now and where you want to take it. It's art. It's an exercise guide. Improve your flexibility and strength with 12 easy, total-body stretches, clearly illustrated on a tear-proof poster. It's the perfect decoration for your workout room. Get a more flexible, better-feeling body with this easy-to-follow wall-mounted stretching guide. This 2'-by-3' poster takes you through 12 stretching exercises for shoulders, back, core and leg. Helpful photo examples show which muscle groups you're working, plus it offers guidance for extending or modifying each stretch to fit your fitness level. It's tear-proof, spill-resistant, and comes with handy grommets for easy installation.